As the previous post suggested, a number of great projects came out of this year's Urban Islands. 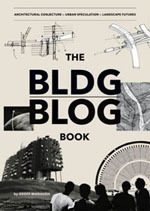 [Image: The front and back of an architectural trading card, designed by Mitchell Bonus for Urban Islands 2009]. I've mentioned it before, of course, but Urban Islands is a biannual architecture studio hosted out on Cockatoo Island in Sydney Harbor. For two weeks, students and their visiting international instructors – I had the huge pleasure of serving as an instructor this year – explore the spatial possibilities of Cockatoo's abandoned landscapes. For now, focusing solely on the work of my own students, I want to highlight five or six particularly interesting responses to the design brief (a brief I'll describe in a later post). The previous post was one project; the following project is by Mitchell Bonus. 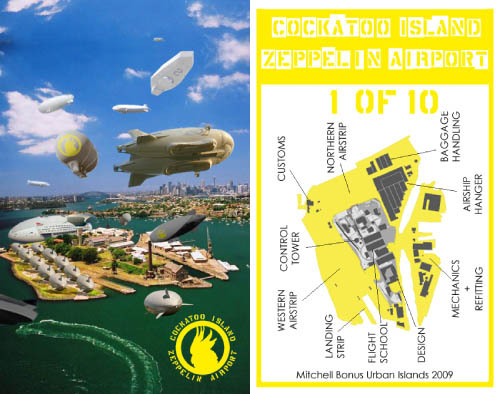 Tongue firmly in cheek, Mitchell has called for Sydney's apparently much-needed second airport to be built out on Cockatoo in the form of a solar-powered zeppelin field. The style of his pitch, however, was strategically ingenious, well worth both study and emulation elsewhere. 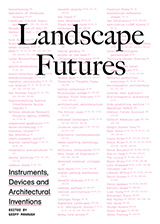 Acting on the assumption that, if you want to see a new building or project take shape, then you have to stop relying on design competitions, architecture blogs, or industry publications to get the word out – that is, you need to find another way to convince the public that your design should exist, making its material realization seem more like an afterthought – Mitchell created a series of trading cards, modeled after sports cards. He then sealed, laminated, and stuck the cards inside bags of potato chips, cigarette packs, and boxes of morning cereal. The idea was thus that people would open up a bag of smoky bacon-flavored chips and find an architectural proposal awaiting them. Inside their morning oat bran would be a trading card-sized vision of the future. Falling out of the cigarette box as they light up on the sidewalk would be a portrayal of some strange island future yet to come. [Image: The fronts and backs of four architectural trading cards, designed by Mitchell Bonus]. After all, why not skip Archinect, ArchDaily, Inhabitat, and Dezeen altogether and simply mass-produce trading cards of your own speculative building plans? Then just hide those cards inside cereal boxes and wait till the ideas trickle out, burning into the collective cultural consciousness. 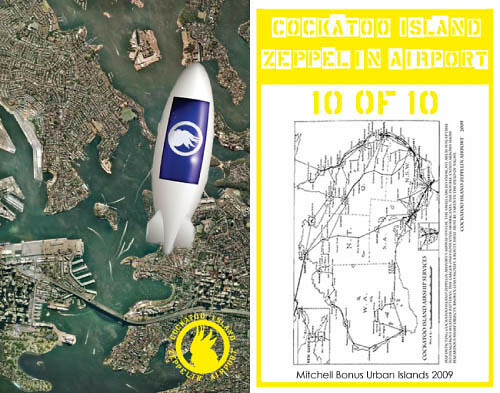 Gradually, it will dawn on people that, of course, there should be a new airport for zeppelins out on Cockatoo Island – or of course there should be aerial gondolas traversing Manhattan, or of course there should be a vast wheel of glass rooms, fourteen hectares in diameter, rotating over the rain forests of Papua New Guinea. It's like subliminal advertising for a parallel future. 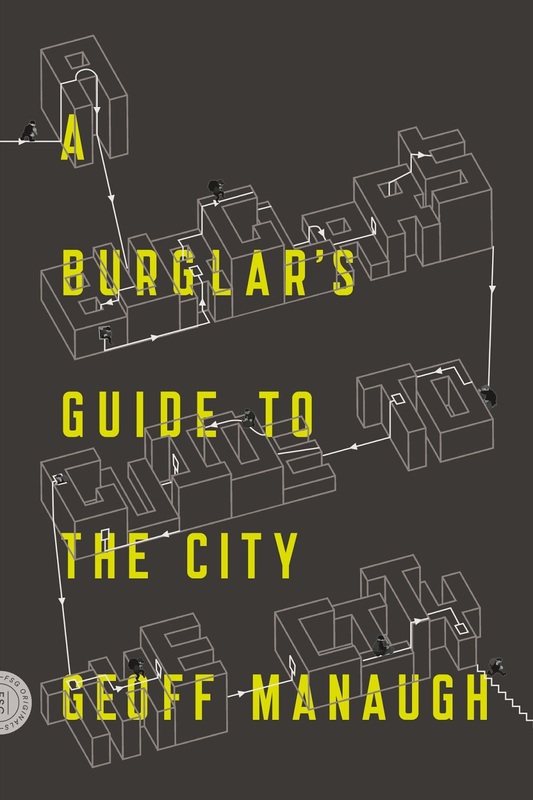 Why not slip these architectural speculations into pop culture at large? Why not bypass clients and experts and just bring your vision to everyone? Isn't that what Hollywood set designers and concept artists have been doing all along? [Image: Four more architectural futures cards, designed by Mitchell Bonus]. Mitchell's project – executed in less than one week (as with all the projects that came out of my studio) – was thus presented simply as a bunch of sealed chip packets, cigarette boxes, and so on. Viewers of his presentation were handed a bag, some cigarettes, or a cereal box and, as they opened up their personal booty, they found not just an edible lunchtime snack but a well-produced act of architectural speculation. How incredibly interesting would it be to find that, in every box of Total or, hiding at the bottom of every canister of oatmeal you open, new visions of the cities around us are patiently hiding...? A whole new urban redesign of Tokyo awaits anyone who buys a bucket of popcorn at the start of 2012. [Image: The front and back of one card by Mitchell Bonus, from Urban Islands 2009]. It's a genuine challenge: publish your next architectural project not as a short article in Log, or as a press release on Dezeen, but as a series of trading cards hidden inside popular consumer goods all over the world. Slip your vision of the future into mass consciousness both slowly and subliminally. reminds me of a blurb I read on the inside jacket of Neuromancer, something about William Gibson not predicting the future but rather "making it"
You put it nicely by saying a simple word, ingenious. Great idea. I'd love to open a cracker jacks box and find one of these at the bottom! It seems to me that there's a lot of innovative potential in these kind of actions. This project and the board game below, really fantastic work and hard to believe all done in a week. In any case, I can't wait to see what else your students thought up. Thanks for sharing. Thai seems like a nice subject to look at .. The magazine is imaginatively entitled The Project Manager (see www.capemedia.co.za), second issue is pending. ha now I know why you were in Australia! This is so great Geoff ! I have a similar idea in which the pod-towers reach up into the jetstream, and hence 'could' just send pods into the stream and hence get around the world, carbon free (ish), extremely fast! Although clearly the benefician point of airships is that fact that they float, hmm.. I hadnt even thought of that, great idea, great project. That, my friend is pure genius, and what a great idea for spreading the idea even though it borders on the scarily subliminal/subversive. I love the tounge in cheek facts and figures as well, 'no airship disasters since 1937' made me laugh. If you want to see more on airships, past, present and future see: www.airshipblimp.com or if you just want a helium sniffing laugh try www.airship.me the worlds only lighter than air comedy site, with lots of funny pictures and U tube links fit for all the family.